Hardware developers have been telling us time and again that requirements on highspeed connectors have increased, calling for SMT connectors that can provide speeds of over 5 Gbps. So far the 10 Gbps version of our Colibri SMT-connector was able to satisfy with excellent signal integrity. Starting in Spring 2019 we’re rounding out the Colibri HighSpeed connector family with the Plug 16+ enabling flawless data transfer rates of USB 3.1 Gen2 and PCI 4.0 signals. Our Colibri COM Express SMT connector exhibits an optimal pin design with which HighSpeed applications of 10 or 16 Gbps and more are realizable without any issues. Simulations show exceptional signal integrity – even with high data transfer rates. Colibri® is a shielded, two-row SMT connector system with a 0.5-mm pitch.It meets all of the specifications for PICMG COM Express®, SFF-SIG CoreExpress®, and nano-ETXexpress. Colibri® products are compatible with all popular connector systems on the market and have been thoroughly tested. 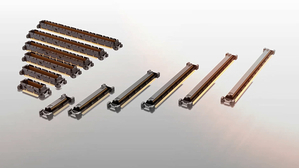 What can Colibri HighSpeed connectors do for your applications? Which board-to-board distances can be generated? Are there different pin counts available? Watch this animated video to find out! The COM Express® standard was developed by PICMG for the computer-on-module (COM) form factor. 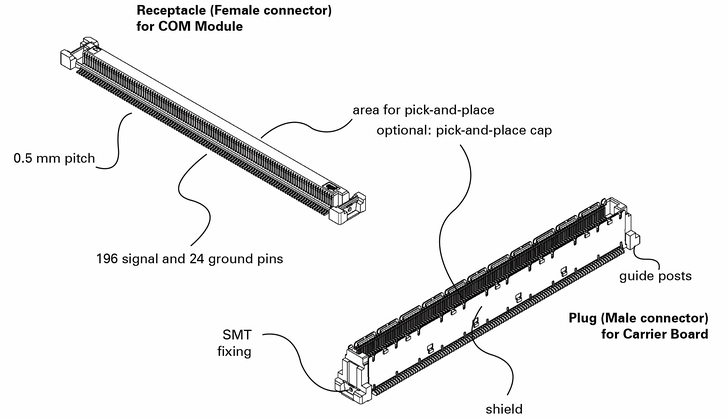 The standard specifies, among other things, what size the module should be and where the mounting holes and pin connections for the carrier board should be positioned. COM Express® modules integrate the core functionalities of a bootable PC, including CPU, a graphics professor, internal memory, and standard interfaces. Connecting a COM module to a carrier board reduces development time and costs. 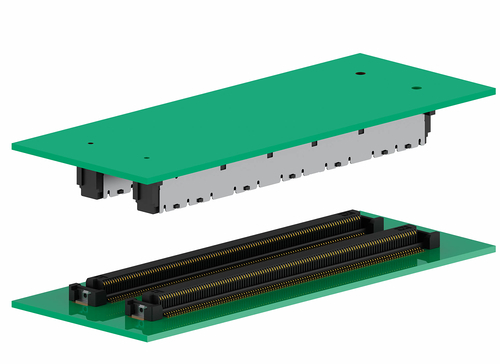 In addition, it is possible not only to extend the cycle of a product, but also to upgrade it by attaching newer, higher performance COM Express® modules to the carrier board. What data transfer rates are the Colibri SMT connectors suitable for? 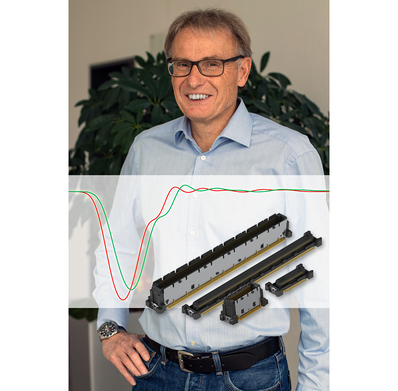 Simulations with the Colibri® COM Express® connector system at 10 or 16 Gbps demonstrate first-rate signal integrity, making the COM Express connector system the top choice for your applications with high data transfer rates of up to 16 Gbps and higher. What highspeed applications are Colibri connectors used for? Colibri highspeed connectors are ideally suited for high data transfer rates – that is, for all types of highspeed applications. These include COM Express and Mezzanine board-to-board systems with data transfer rates for 10 Gigabit Ethernet and PCI Express Gen3, for example. Where are PICMG-compliant Colibri connectors already being successfully used? Colibri COM Express connectors are already in use in the fields of industrial automation, kiosk and POS systems, medical technology, metrology, consumer electronics and gaming, the transportation industry, as well as facilities engineering. How can Colibri SMT circuit board connectors be processed? The Colibri connector system is processed using surface-mount technology (SMT) – in other words, it is soldered directly onto the circuit boards. The connectors are delivered in tape-and-reel packaging, allowing for fully automatic pick-and-place processing. Is a placement aid necessary for processing Colibri highspeed connectors? The Colibri receptacle is designed to have a big enough pick-and-place area for vacuum pipettes and therefore needs no additional placement aid. The Colibri plug, too, can be assembled reliably without extra placement aids using a narrow vacuum pipette. Are the PICMG Colibri connectors also delivered in tape-and-reel packaging? Yes, Colibri SMT connectors are delivered in tape-and-reel packaging, allowing for fully automatic pick-and-place processing. Delivery in tray packaging is also possible on request. Are Colibri COM Express connectors UL-recognized components? Yes, Colibri connectors from ept are UL-recognized components in the U.S. and in Canada. Are the ept circuit board connectors RoHS compliant? RoHS (Restriction of Hazardous Substances) is a directive on the restriction of the use of certain hazardous substances in electrical and electronic equipment. We confirm that Colibri connectors from ept are RoHS certified and compliant with the RoHS directive (2011/65/EU). You can find more detailed information at RoHS & REACH. Out of respect for our customers’ wish for discretion, we do not list the sources of the following quotes. However, we guarantee the full authenticity of these testimonials. The fact that COM Express connectors from ept provide the best eye diagram values (jitter, eye height, and eye width) was the decisive factor for us. We were able to extend the level of automation of our mounting machines thanks to the tape-and-reel packaging for Colibri connectors, allowing us to save production costs. We have exclusively approved the Colibri connectors for our 10 Gbps application. We have had no problems whatsoever with the wetting step during reflow soldering ever since we started using Colibri highspeed connectors. Our manufacturing productivity has increased enormously thanks to the tape-and-reel packaging of Colibri SMT circuit board connectors. We received phenomenal support from ept when we were introducing Colibri connectors to our production environment. We felt that we were in excellent hands. ept guarantees the availability of Colibri connectors. This was extremely important for us. The limits of the Colibri 10 Gbps have been reached. The new Plug 16+ is breaking through those limitations: Data transfer rates of USB 3.1 Gen2 signals have been working flawlessly since.